*Combine biscuit crumbs and butter in a bowl and rub the ingredients using finger tips to form a dough. Press dough over the base and sides of a 26cm loose bottom tart tin. Set aside. *Add pumpkin, sugar and milk to a large saucepan. Stir over medium heat for 10 minutes or until milk thickens. Remove from heat. *Add Sweetened Condensed Milk, rosewater and ground almond to the pumpkin mixture and mix well. 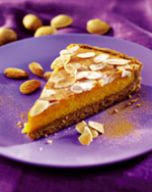 *Spoon mixture into the prepared tart tin. Bake in a 180˚C preheated oven for 45 minutes. *Allow to cool in fridge for 2 hours before serving. *Tip: Stir constantly to avoid scorching. Add a bit more milk if the milk evaporated quickly before the pumpkin was well cooked.